Product prices and availability are accurate as of 2019-04-18 00:05:45 EDT and are subject to change. Any price and availability information displayed on http://www.amazon.com/ at the time of purchase will apply to the purchase of this product. 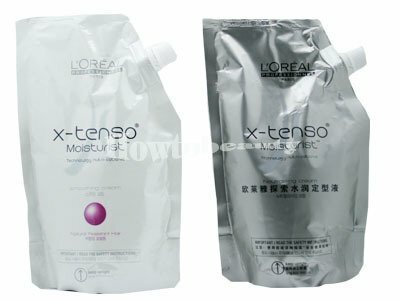 Loreal X-tenso: Resistant Hair Best for Resistant hair type Description If you spend your morning blow-drying and taming your rebellious for hours due to curly, wavy, or frizzy hair, the new Brazilian Straightening Look from X-Tenso® MoisturistTM is what you have been waiting to get rid of your routine. X-Tenso® MoisturistTM make over your rebellious, curly, wavy, or frizzy hair to smooth, beautiful-silky and shiny hair for up to 2 months. X-Tenso® MoisturistTM is designed to give a "natural-looking" result. You can choose how smooth you want your hair to go depending on the level you prefer. Direction for use Straightener No.1 Coats the entire hair evenly, except for roots and let it set at room temperature for 10 - 20 minutes. After that, rinse it sufficiently with plain water, dry the hair and set with hot straightening iron at 180°C/ 356°F. When applying, keep 1 - 2 cm above hair roots, as getting it on the scalp could cause irritation and breakage of hair. Use an intermediate water to rinse it away completely. Wash the roots carefully. Neutralizer No.2 Coat the entire hair and leave it for 20 - 30 minutes, at the same time combing it lightly. Then, completely wash it away. Complete the process. If the neutralization is not complete, it could cause damage or hair breakage, thus coat the hair sufficiently from roots to tip of hair to make sure the neutralization process is completed.